Never did I think that some tiny spore-forming bacteria would be responsible for radically shifting my professional career or my life. Two years ago, I didn’t even know that such organisms existed. I was plodding along, moving from one ‘professional-grade’ probiotic product to another, trying to find something that would really help my clients and those who attended classes and workshops that I taught. I understood that our microbiome, the trillions of tiny organisms that make our body home, was extremely important – but I was becoming increasingly frustrated with the lack of consistent positive results after trying at least twenty different brands of the ‘best’ probiotics on the market. These included, but definitely not limited to: Klaire, Biokult, VSL#3, Innate Response, Designs for Health, Standard Process, Orthomolecular, Theralac, Garden of Life, Custom, and many other very respected, very expensive practitioner-only products. NOTE: I still use products made by several of these companies, and am definitely not claiming these companies to be misleading, producing poor quality products, or anything of the sort. Finally, I came across something different. While listening to an episode of Chris Kresser’s (well-known Functional Medicine Practitioner) podcast, I heard him discuss soil-based organisms. The product he mentioned, specifically, was Prescript-Assist. Chris went on to explain that he’d seen better results with these type of organisms, and this product specifically, when compared with his experience using conventional probiotics – which generally consist of various strains of lactobacillus and bifidobacterium. With nothing to lose, I decided to give this product a shot. If nothing else, it was something different than what I’d been doing. Initially, the results were rather encouraging. More people saw positive results than I had seen with any conventional probiotics, that’s for sure. There were still, however, many people who didn’t do well, or saw nothing at all. The improvements were generally very subtle for most people, if noticeable at all. Yes, it was better… but nothing really spectacular. That’s when I stumbled upon a webinar titled ‘Forget What You Know About Probiotics‘, directed at practitioners, and hosted by Dr. Thomas Bayne, DC and Kiran Krishnan (Microbiologist) – the founders of Physicians Exclusive and creators of MegaSporeBiotic. Needless to say, the information presented definitely peaked my interest. It was different, intriguing, and made sense. asthma were almost non-existent and she felt great. As mind-blowing as this was, it was about to get even more unbelievable. The first person I gave the product to was my mother-in-law. She had recently been diagnosed with Hashimoto’s, an autoimmune condition which attacks the Thyroid. Auto-immunity is strongly linked to gut permeability issues, GI inflammation, and gut dysbiosis (wrong bugs). She had also suffered from life-long severe (often requiring hospitalization) asthma and allergies (mainly to pets). Within a few weeks, she was reporting back that her allergies and asthma were almost non-existent and she felt great. As mind-blowing as this was, it was about to get even more unbelievable. A few weeks later, so maybe 6 weeks after she began taking the spores, she came to visit us. We have a dog and a cat, so previously there is no way she would have even been able to come in our home. Not only was she able to be in the house, she was able to pet the animals, which is something she hadn’t been able to do in decades without risk of life-threatening reactions. To say this was emotional for her doesn’t do the situation justice. Life-changing is more accurate.I was sold. From there, I started recommending the product to my clients, and in several Facebook groups that I’m in. One person after another was reporting back to me with rather amazing results, which I honestly wouldn’t have believed a few months prior. Word spread like wildfire through some of the Facebook groups and I started to get messages and emails daily from people asking how they could order the product. 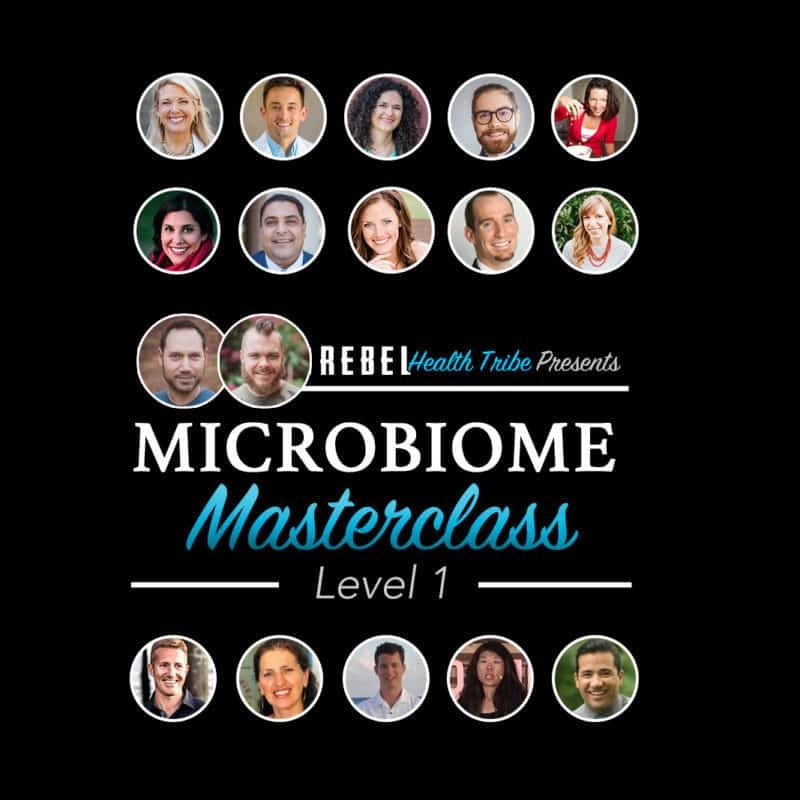 I called Joe (co-founder of Rebel Health Tribe) and told him that we absolutely had to have Kiran on as a guest expert interview for our Primal90 Program to discuss all things microbiome, gut health, and spores. Kiran agreed, and his interview aired near the end of our month-long free launch event. Our inbox exploded. We had dozens of requests for Megaspore, and for ‘more Kiran’. We worked out an arrangement with Physicians Exclusive which enabled us to allow our clients and members to order the product (it’s a practitioner-only product) via our account, so long as we provide them with instructions, education, and support regarding safe and optimal use of the product. Megaspore is now available to all of our premium Primal90 Members, private coaching clients, as well as all of our Free Members. Kiran agreed to be our featured guest on monthly Microbiome Series webinars, of which there has now been 6 episodes. These have become immensely popular, and we now have thousands of people, including dozens of practitioners, doctors, etc… who regularly tune in. These tiny little spore-forming dynamos have totally transformed my practice, our business, and the inner ecology of thousands of people! So… you’ve probably got about a dozen (or more) questions at this point. Let’s try to answer some of them. The Human Microbiome Project – What does the current research regarding the microbiome say, and why is this important? There are approximately 10 trillion bacteria in (and on) our bodies vs. only 1 trillion human cells. That’s right. We have 10x more bacterial cells than we do human cells. There are over 1,000 species of bacteria found inside our GI tract. Bacterial genes outnumber human genes 150:1. Our cells use bacterial DNA. No two people have the same microbiome, not even identical twins. Several diseases are directly associated with a disruption to the microbiome. These include, but are not limited to: Crohn’s, IBS, Asthma, Allergies, and Obesity. Pathogenic bacteria/organisms (candida, h.pylori, etc…) are natural inhabitants of our gut, and are not problems in optimal conditions. Eradicating them entirely has consequences we’re just beginning to understand. How is Our Microbiome Populated? During vaginal childbirth, we are exposed to our mother’s microbiome. This occurs via the birth canal, and exposure to feces during the birth process. We receive between 400-600 different species via breast milk. Also, breast milk contains a powerful prebiotic (feeds good bacteria) which helps these strains to proliferate and colonize inside our GI tract. An infant’s microbiome reflects the mother’s vaginal bacteria for a few months, and then begins to resemble the mother’s mouth, skin, and gut after that. After the very early stages of life, the microbiome is generally populated via environmental and food exposure. Those who grow up in/live in a rural environment generally have much greater microbiome diversity/health than those who grow up in/live in urban environments. After approximately 2 ½ years, the microbiome resembles that of adults. Diversity is more important than overall population of certain strains. A diverse microbiome will perform more functions, provide more benefits, and be more resistant to invasion, infection, and/or overgrowths. So what can we learn from this information? C-Section births and formula (vs. breastmilk) can have a very real impact on the diversity and overall population of a child’s microbiome. Anti-biotic use, especially at a young age, can have an incredibly destructive effect on long-term health of the GI microbiome… and in turn, the health of that child/person. Hand sanitizers, anti-b acterial soap, and overall germ-phobia can have a very real, and significant detrimental effect on the development of healthy GI flora – especially related to diversity. Our microbiome environment is largely determined by the time we are 3 years-old. What Affects the Microbiome After Infancy? Why are we all messed up? Age – Our microbiome population and diversity gradually decline with age. Physiology – Factors such as surgery (anesthetics), and activity levels can have a major impact on the microbiome. Diet – The quality of our diet can have a significant (positive or negative) impact on our microbiome. Genetics – There is a very loose correlation here, but worth mentioning. Chemicals/Toxicity – We are exposed to thousands of chemicals, metals, etc… on a daily basis. Many of these, such as chlorine (in tap water), and artificial sweeteners (junk food, soft drinks, etc…) are a couple examples of this. Alcohol, Tobacco, Pharmaceutical Drug – Sorry, friends. Booze, smokes, and drugs are not friends of your microbiome. Sales of probiotics have eclipsed $800mil annually, according to many estimates. There are dozens, probably hundreds, of different products on the market. As already mentioned, I’ve actually tried or utilized at least 20 different brands, products, strains, etc… myself, and with clients over the last 8 years. I’ve seen a few success stories, but overall – results from probiotic supplementation, especially if done without other supports such as digestive enzymes, Betaine HCL, anti-microbials to fight infections/overgrowths, etc… have been lukewarm at best. The common approach/line of thought, when it comes to probiotic supplementation, is to “re-seed” with high doses of specific bacterial strains that we have found in certain areas of the digestive system. Unfortunately, I’ve learned this approach just simply doesn’t work. 1) What is the survival rate of this product/strain? In order to have any benefit, a probiotic must be able to reach the desired location within your GI tract, while still alive. Many strains of bacteria included in probiotic supplements today are very fragile, even requiring refrigeration. The human gut, on the other hand, is over 96 degrees, involves very low pH (extremely acidic) environments, and is actually designed to keep out invading microbes. At pH 1 (optimal stomach acid) – none survived with any viability. Those 6 were put through survival tests to determine survivability in the large intestine, and only 4 showed any survivability. So, at the end of the day, only 4 of the 35 strains showed any chance of survivability, and even that was at, or around 50%. These are not very good odds of survival. Another study looked at two popular yogurts (Chobani®, Dannon®), and a leading commercial probiotic (Ultimate Flora Critical Care ®) and found that the bacteria within those products had a survival rate (pH 1.3 for 2 hours) of less than 1%. All-in-all, this does not say much for the survivability of most probiotic supplements. 2) What is the fitness of this particular strain? Many common probiotics are actually aerobic (using oxygen) bacteria attempting to seed in an anaerobic (no oxygen) environment. This is akin to trying to plant a bunch of fish in the desert. Also to consider: can this strain(s) avoid immune destruction? Are there binding sites available for this strain(s)? Bacteria viewed as invaders will be attacked, and find it difficult to adhere to the intestinal lining. In fact, a study done in 2007 tested the adhesion ability of 11 strains of lactobacillus and found that the best of the bunch had an adhesion rate of 38%, followed by 24%, and then down from there. This was using an intestinal cell lining model – giving the bacterial a completely optimal environment… unlike most people’s actual gut lining. Not a very good showing in regards to the overall fitness of most probiotic products and common strains being used. 3) Is it Natural? Good questions to ask here would be: Are these strains found in nature? Did the strains in these products co-evolve with each other, and with humans? Do they belong in the human microbiome? Also to keep in mind is that diversity is more important than sheer volume/numbers. Overloading a few specific strains does not help with diversity… and diversity is the goal! I’ve actually seen people create symptomatic imbalances in their microbiome by taking high doses of the same few stains over an extended period of time, or by over-doing it with the same fermented food in high doses, daily, for extended periods of time. More (volume) is not always better. 4) What is the quality of the product? There have been a few studies and investigations into the actual quality of probiotic products, in general, and what has been found is rather alarming. The European Union, when looking into the issue, found that many products contained strains different than were labeled (some were pathogenic), contained the wrong number of bacteria, contained mostly dead bacteria, and several other disturbing misrepresentations and indicators of poor quality control. Do you really know what you’re getting? More often than not, no… you don’t. In summary, when we look at this “reseeding” approach through the lens of survival, fitness, nature, and quality, it doesn’t really seem like a very effective approach. Spore-form bacteria are robust organisms that can survive the harsh environment of the stomach 100% intact. Through the evolutionary process, nature designed them to be transferred from human-to-human via the environment and food. They have evolved to be very stable in the environment and also to colonize the GI tract very effectively. In fact, studies have shown that certain developments of the human immune system specifically require spores. They are found all over the environment (soil, vegetation, dust, rocks, aqua-environments, digestive systems of insects, marine life, mammals, etc.) which means as a probiotic they are evolutionarily supported – a true probiotic. Spores remain dormant until they get to the intestinal tract and then they colonize the bowel. They pass through the stomach and upper GI with 100% survivability. They are universally found in the human microbiome. They are normal organisms of our digestive tract. There is a LONG history of use in industries where efficacy is closely measured, for example the pharmaceutical and agriculture industries. Human studies have proven spores to be extremely safe and efficient. I realize, at this point, you probably feel like you’re reading a commercial, thinking to yourself “ugh… here comes the pitch”. Trust me, I feel like I’m writing one. I have, in fact, never written an article regarding a specific product in my entire career. That is how strongly I feel about this subject, and how confident I am in the information being provided. It was developed under the advisement of spore expert Dr. Simon Cutting, Ph.D., by a practitioner for exclusive distribution by medical practitioners. It utilizes verified, branded and registered strains – the only way to ensure proper characterization. Guaranteed prescription-grade and licensed from Royal Holloway at London University. It is the only nutritional supplement probiotic on the market that contains Bacillus Clausii – a strain tested for more than 50 years, and is the best-selling probiotic prescription product in the world. It contains five bacillus spore probiotics– the value of each strain is substantiated by a history of use and published science. All strains are produced in a GMP facility under drug manufacturing guidelines. It is the single-most, powerful spore probiotic formulation, and it delivers more than four billion live probiotic cells daily – a dose that matches and exceeds all prescription products of the same strains. This goes a lot further than 100bil live probiotic cells of typical strains, which will mostly die-off in the process of getting to their target. It is the most broad-spectrum probiotic. The clinically studied strains used in the formulation offer more than 35 indications for use in practice. It is the FIRST probiotic formulation to deliver powerful, highly-bioavailable carotenoids via in-vivo production. Bacillus indicus is a patented, carotenoid rich strain. Up to a 40% increase in Short Chain Fatty Acids (SCFA) production. SCFA’s are known to increase colonic blood flow, improve fat metabolism, lower cholesterol and triglyceride levels, and reduce gut/systemic inflammation. Help to develop GALT (Gut-Associated Lymphatic Tissue), an essential aspect of our GI immunity and integrity of the GI lining itself. In Summary – What to make of this information? Personally, I’ve never seen any single supplement, product, etc… of any kind have anywhere close to the incredible impact we’ve seen Megaspore have with hundreds of people over the last 9 months or so. If you’d have told me a couple years ago that I’d see what we’ve seen, I wouldn’t believe you. That being said… why the big difference? The idea that we can ‘re-seed’ or ‘re-populate’ our gut just isn’t backed up by much evidence or research. I saw very little positive results when using the ‘best’ conventional probiotics on the market in my practice. This is likely because most do not survive the gastric environment, actually colonize the gut, or produce any real beneficial effects. Some popular strains in conventional probiotics can actually create more problems for people, especially those with histamine issues or Small Intestine Bacteria Overgrowth (SIBO). Nowhere in nature, after infancy, would we encounter billions of lactobacillus or bifidobacterium, or any other strains used in conventional probiotics – they are inoculated via birth, breastmilk, contact with mother, and a little from the environment. We evolved with these organisms, and they play several very important roles in our GI health/function – including, but not limited to: reducing inflammation, combating unwanted organisms, producing essential nutrients and enzymes, regulating our immune system, and creating an environment which is more hospitable to the friendly organisms which are beneficial to our health and more difficult for pathogenic (harmful) organisms to survive. Next Steps – Where to go from here? The FIRST thing is to sign up to see our popular Microbiome Series. You’ll also be given access to more information on MegasporeBiotic including how to order. ​​Michael Roesslein is a health educator, film producer, digital marketer, and co-founder of Rebel Health Tribe. He holds a Master’s Degree in Exercise Science & Health Promotion (MSc), is a certified CHEK Holistic Lifestyle Coach (HLC), and a certified Functional Diagnostic Nutrition Practitioner (FDN-P). Michael is also a producer of The Human Longevity Project - an international documentary film series scheduled to be released in May of 2018. When not working on 12 work projects simultaneously, Michael enjoys boxing, traveling, cooking, eating, hiking, camping, spending time outdoors, reading, learning, watching films, and trying to make a positive impact on the world. Originally from the Chicago area, Michael currently lives in San Diego, California with his wife Mira and their animal parade (2 dogs & 1 cat). His son, Michael, just finished his first semester of college in Arizona.